Department Stores for Our Babies’ Genes: Must They Be Regulated? He Jiankui spoke at the second international summit on human genome editing in Hong Kong. Written by FASPE Medical Fellows: Alexa Kanbergs and Joseph Scarpa, Jr. 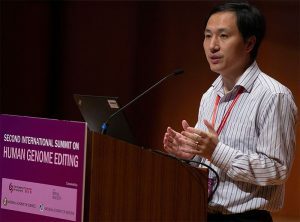 He Jiankui, a Chinese biophysicist, claims that he has edited twin human embryonic genomes with a new technology called CRISPR-Cas9 to produce the first humans born with artificially edited genomes. The reception by the scientific community has been primarily one of intense criticism. Despite being impressed by He’s state-of-the-art technology, leading researchers have described this as a “failure of self-regulation.” He’s work raises questions regarding how broadly a medical researcher’s responsibility extends to the potential unintended consequences of his or her work and how critical is that researcher’s obligation to existing patients who may benefit from unrefined research and technology. He, a researcher at China’s Southern University of Science and Technology, edited a gene, named CCR5, which provides the route by which HIV infects the immune system. Given the high prevalence of HIV in China, removing both copies of CCR5 would theoretically protect someone from contracting HIV. One of the twins, whose genome He manipulated, had both copies of the gene removed, while the other only had one gene successfully removed by the technology (meaning that he would still be at risk for HIV). Regardless of this difference, the parents decided to have both embryos implanted in the mother. The literature regarding the ethics of gene editing usually breaks down into a discussion regarding cure vs enhancement. Interestingly, He’s actions are an example of enhancement for the sake of disease prevention. The backlash has been severe. Some have stated flatly that this technology was not ready for human application, while others wished He had targeted other genes for elimination that would cure a disease, like Huntington’s or Tay-Sachs. The Chinese Academy of Sciences has condemned this work, the top scientific societies in China have stated that He violated human rights laws, and Francis Collins (director of the US National Institute of Health) has called for the development of a “binding international consensus” to regulate this type of research. A secondary ethical dilemma wrapped into this case is how scientific norms are discovered, agreed upon, and enforced, and whether medical scientists are bounded by these norms even at the potential expense of a particular patient. Read the original article posted on Nature. ← Religious Law or Civil Law; What Should Govern in the Case of Sexual Abuse by Clergy?